When you think Easter, there are a few things you think of: religious meanings, spring time, Easter eggs, and the Easter bunny. Now, what’s the first thing you think of when you think bunny? If you’re hosting Easter this year, then you’ve got to decorate your house for the holiday, especially your table! 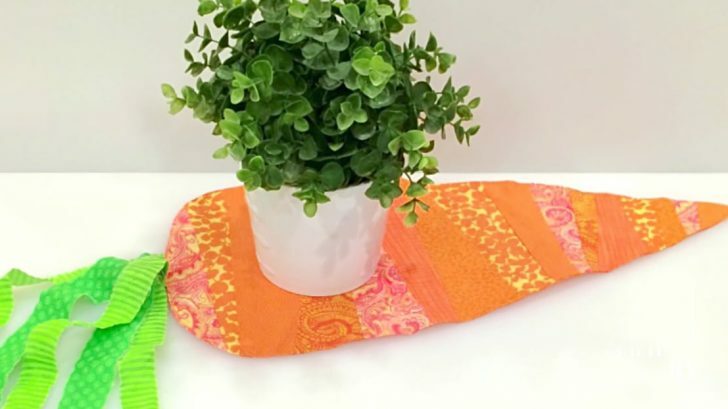 So in honor of the Easter bunny, decorate that table with a carrot table runner! That’s right, YouTube channel ThriftyFun shows us how it’s done in a video tutorial. You’ll be finished with this adorable runner in no time! First, begin by creating a carrot template that is 10″ by 18″. Cut triangular strips of fabric that are at least 1/2″ longer than the width of the template. Sew your strips together in a patterned look, with orange in the forefront. Set this aside, and cut out a piece of fabric for the back of the table runner, like an orange. In the meantime, cut up some green strips about 1-2 inches wide for the top of the carrot. Cut those into 4 equal strips. Arrange those strips and pin them to the back of the carrot. Pin the strip set to the carrot backing, right sides facing together. Make sure the carrot strips aren’t sewn to the front seams. Leave an opening to turn it right side out. Snip the end of the carrot and clip corners. Turn it right side out and press with an iron. Then that’s it, you’re done! Watch the video below for a visual on how this is done. Happy Easter!